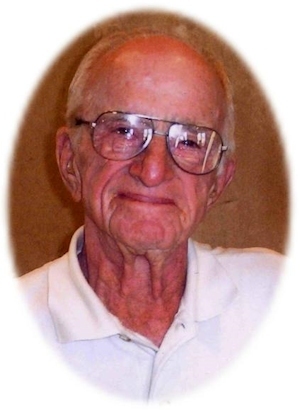 Obituary – Dauman, Eugene Robert « Perry High School Alumni Association, Inc.
Eugene Robert Dauman, 86, known by everyone as Gene, died Friday, June 23, 2006. As a lifelong member of St. Rose of Lima Catholic Church, this was an event he had prepared for every day of his life. His faith and his love of the Lord had been his constant companion, his source of strength and his ever present comfort. A funeral mass will be at 3 p.m. Tuesday in the St. Rose of Lima Catholic Church. Father Tom Dowdell will officiate. Interment will be in St. Rose of Lima Catholic Cemetery. Services will be under the direction of Brown-Dugger Funeral Home. A rosary will be at 7 p.m. Monday in Brown-Dugger Funeral Home Chapel. Virginia Gengler will recite the Rosary. He was born Oct. 10, 1919, on a quarter section of land seven miles southwest of Perry, the same land his grandfather, George Dauman, staked in the opening of the Cherokee Strip. He lived there with his parents, Frank John Dauman, formerly of Wyandotte County, Kan. and Eda Mary Hempfling Dauman, his brother Marvin (deceased) and his sisters, Dorothy (deceased) and Rita Dauman Imgarten of Perry. He was always proud of the fact his family has been in Noble County more than 100 years. His education began in the Hempfling rural school (named after his mother’s father, George Hempfling), and then continued in St. Joseph’s Catholic School in Perry. When St. Joseph’s discontinued grades 11 and 12, he enrolled in Perry High School. He thoroughly enjoyed attending sports and band activities at PHS. He remained an avid Maroon fan until his death. Perry Pee-Wee Baseball Association was a big part of his life for many years as well. He served as president and both he and his son, Jay Rodney, were active until Jay’s death in 1959. During his lifetime, he participated in several community and church organizations. Some of his responsibilities over the years were general chairman and president of the United Fund and president of the Lions’ Club. He supported the 4-H and was chosen as a lifetime honorary 4-H Club member. He was a member of the Knights of Columbus and was very active in the PHS Band Boosters. He was a fisherman all of his life and loved the sport. Long before his retirement, and certainly afterward, his time was spent at the Perry Golf and Country Club. He golfed almost every day, especially enjoying his time with the Mountain Dew Gang. He was proud of the fact he was the club’s “oldest living member.” He spent countless hours at the club — golfing, fishing, ball hocking and his favorite sport, talking. The country club kept him young. He worked for 31 years at the A.C. Houston Lumber Co., in Perry. He started at the company after high school and worked his way up to manager. His years with A.C. Houston took him to Washington, Kansas, Boise, Idaho and Las Vegas. It was his days at A.C. Houston that provided his nickname, “2 x 4” (Two By Four), that he was lovingly called by his friends. He loved his job. He loved to say how many homes for which he’d drawn the house plans in Perry. He also loved to drive the company’s forklift in the Cherokee Strip Celebration parades. After A.C. Houston was sold, he worked in sales for Gates Hardware (Tulsa) for several years before he retired. His true pride and joy was his family. His wife of 67 years, Maxine Fay Branham Dauman, was the love of his life. They married Dec. 28, 1939, in St. Rose of Lima Catholic Church and have lived most of their married life in Perry. Ever present on his mind were his children and his “grandkids,” of whom he was immensely proud. Their joys and their sorrows were also his. “PaPa” would pray for each and every one of them, literally, everyday. All of his children, grandchildren, great-grandchildren and great-great grandchild agree that he was, indeed, the best Dad and PaPa ever. We all thank God for him. God gave him many gifts. He had a fantastic sense of humor. He seldom was without a smile. He was a source of laughter to all. He was trustworthy, honest and hardworking. He was loyal. His faith in the Lord was unshakable. He was a loving, kind, sweet, considerate husband, father and grandfather. He was a good man. He will be deeply and forever missed. He was preceded in death by his son, Jay Rodney Dauman. Surviving him are his wife, his daughter and son-in-law, Marvie and Bill Rotter of Perry; his daughter and son-in-law, Cindy and Bill Luttrell of Midwest City; his daughter and son-in-law, Jill and Michael Potter of Willis, Texas and his sister, Rita Dauman Imgarten of Perry. His grandchildren, great-grandchildren and great-great grandchild include Pamela and Steve Sherrill and their children, Cooper and Mary Lauren of Fairfax, Jared and Justina Reaves and their son, Remington, of Wayne, Kyle Reaves of Perry, Rick and Carolyn Hansing and their children, Jack and Lilly, of Edmond, Jay Luttrell of Oklahoma City, Evan Luttrell of Midwest City, Gabe Luttrell of Oklahoma City, Kari Luttrell of Midwest City and Mason Potter of Willis. Donations may be made to either Judith Karman Hospice or St. Rose of Lima Catholic Church in care of Brown-Dugger Funeral Home, 1010 N. Seventh St., Perry, 73077.